Moles and voles go wherever they want to go, and eat whatever they want to eat. They leave raised tunnels in lawns and garden beds. Both are small mammals, about 4″-6″ long as adults, and both live underground. Moles prefer to eat insects, earthworms, and larvae that live in the top few inches of soil. Voles, which look like mice, are herbivores; preferring to eat roots, grass, seeds, and whatever plant material they can drag down into their tunnels. These destructive critters love freshly dug soil and newly planted plants; a real problem for many gardeners. When you plant out a bed of transplants voles think you’ve prepared them a luscious buffet. We’ve had newly purchased plants simply disappear overnight, eaten before they could even root into the surrounding soil. As many moles or voles as you trap or kill, there seems to be a constant supply of new ones ready to take over the yard, with new ones born regularly between May and October. There damage tends to be worse after a good rain when the ground is soft. 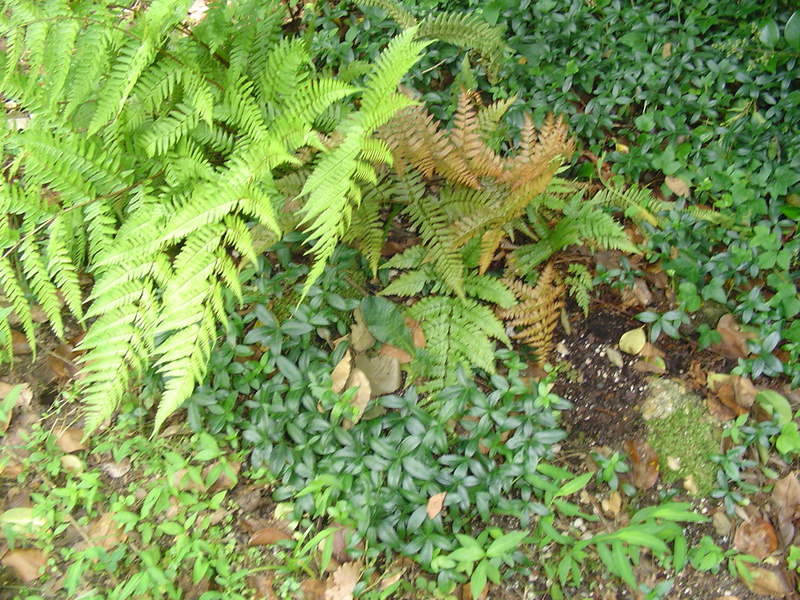 A vole hole under a fern in a shaded area is only one of at least four networked holes all connected with tunnels. We’ve noticed that mole and vole activity seems to be worse in shaded areas than sunny, and that they go crazy under any area mulched with bark or leaves. We’ve had whole areas dug up in a single night, and have even found them tunneling under some lawn during the day. These guys will just destroy new plants and tear up the ground if left unchecked. Worse, in our yard, we’ve found snakes also use the vole holes and tunnels for their own purposes. Some people will bait the tunnels with poison, but I choose not to use poisons, especially since we have neighboring outside cats. Some people leave traps to catch moles and voles. But then you have to do something with the creatures once trapped. Eliminating all moles and voles isn’t going to happen in a forested neighborhood with lots of green space, but, there are some things you can do to slow them down. 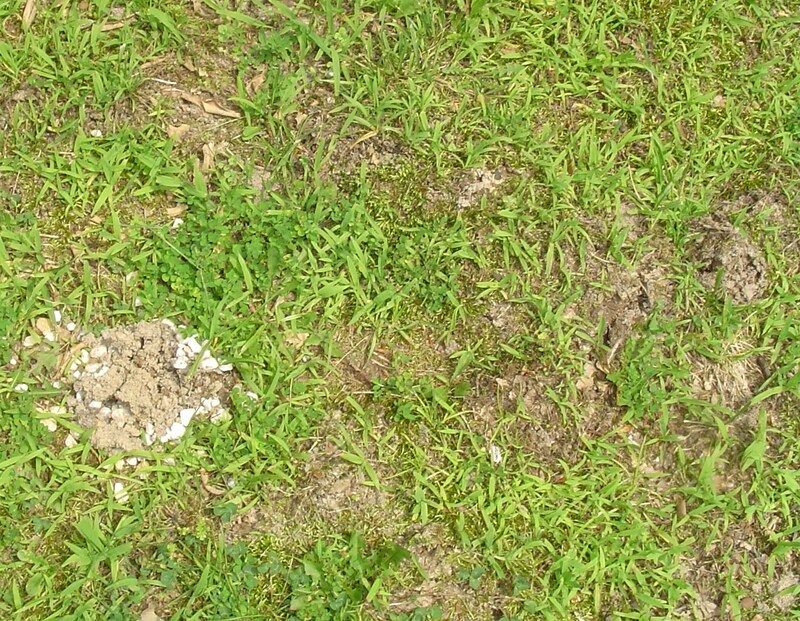 Vole hole, through an earlier patch of gravel, and surrounding tunnels in the lawn. First, we destroy the tunnels and holes whenever and wherever we find them. We stomp the tunnels flat, and fill the entrance holes with pea gravel. If you find one hole, there will probably be another nearby. Before I started filling the holes with pea gravel, we put rocks, bottle caps, moth balls, and other treasures into the tunnels to obstruct them. Moth balls are especially effective at chasing these critters out of a particular tunnel. Over the years, we have also stumbled across a non-poisonous way to eliminate some of the ‘activity.’ A friend tipped us off to using chewing gum as a bait. We use sticks of Double Mint or Juicy Fruit gum, still in its wrapper, and torn into three or four portions per stick. When we find a hole or tunnel, we simply push one of these little baits into the earth before we stomp the tunnel or fill the hole. This method has proven helpful in reducing the population. A product called “Milky Spore,” which is a powdered bacterium, can be sprinkled on lawns. One application will allow this bacteria to grow in your soil, killing off the larvae of the Japanese beetle. These larvae are a major food source for moles, and many find that using milky spore reduces the tunneling in their lawn. Milky spore is not poisonous, won’t harm pets or other wildlife, lasts in the soil for years, and is widely available in hardware stores and garden centers. As a bonus, it will reduce the Japanese beetle population, which may feed on your roses and other perennials in early summer. Gravel and Plant Tone ready to be mixed into the bottom of a planting hole. When planting anything new, I mix pea gravel into the “back-fill” under and around the plant. The gravel can improve drainage in the soil, and will slow voles down as they try to attract the roots of a plant. I also mulch around newly planted beds with pea gravel to slow down the squirrels who may want to dig them up. Use pea gravel in the “back-fill” soil under and around new plantings, and then mulch around the new plant with pea grave. This discourages moles and voles from eating the roots of your new plant, and discourages squirrels from digging around it. 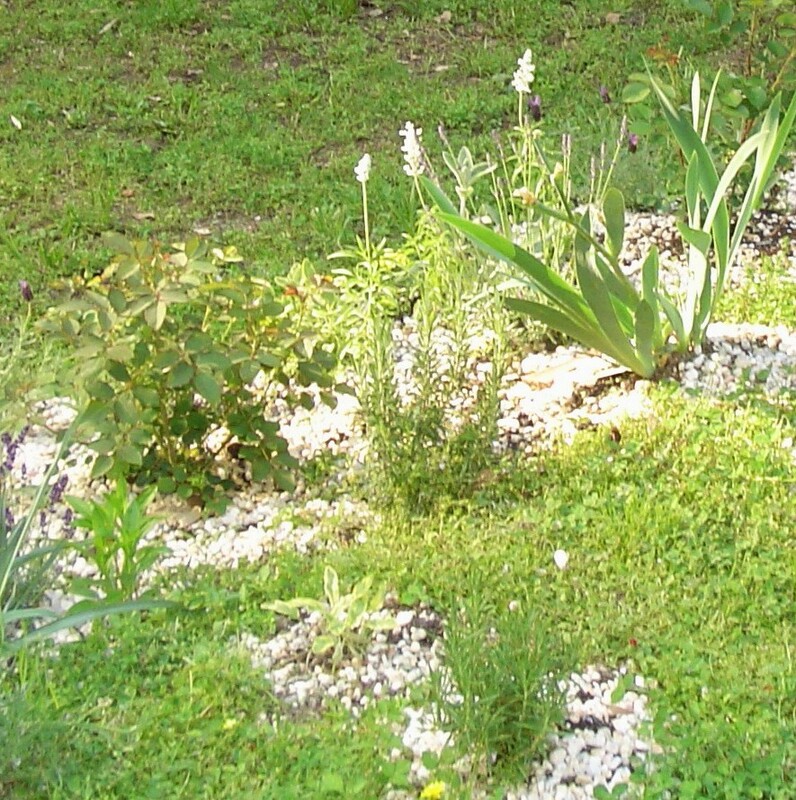 Herbs benefit from the reflected heat and sunlight, and the soil is held in place on a slope. You might also create a ‘living fence’ of poisonous roots around an area that you need to protect from hungry voles. You will find that there are many plants with poisonous or irritating compounds in their roots, stems and leaves. My favorite plants to use this way are Narcissus and Hellebores. Plant these plants around shrubs whose roots you want to protect, in mixed borders, and as a barrier around areas of lawn. Narcissus, planted a bulbs in the fall, are an fairly inexpensive investment and multiply over the years. They grow all winter long and bloom in the spring. Although their leaves die back in early summer, their roots and bulbs continue to work as a barrier year round. Narcissus are beautiful but poisonous. Their bulbs and roots can form a ‘living fence’ to protect other plants form hungry voles. Hellebores, an evergreen herbaceous perennial, are available in garden centers from late autumn through the spring. They bloom from late December through early May, and serve as a ground cover through the summer months. They have large, fibrous root systems. Hellebores bloom through the winter months, but their large root system can protect an area from voles year round. Once established, Hellebores produce lots of seedlings, which you can transplant to new areas you want to protect. Most gardeners cut back the old Helleborus leaves in the spring to make way for new growth. Consider using old, ragged Hellebores leaves you’ve trimmed back as a mulch around other plants you want to protect. As the leaves decay, their poisonous compounds enter the soil. A new raised bed, bordered by recycled bricks, is filled with topsoil and compost, ready for planting. 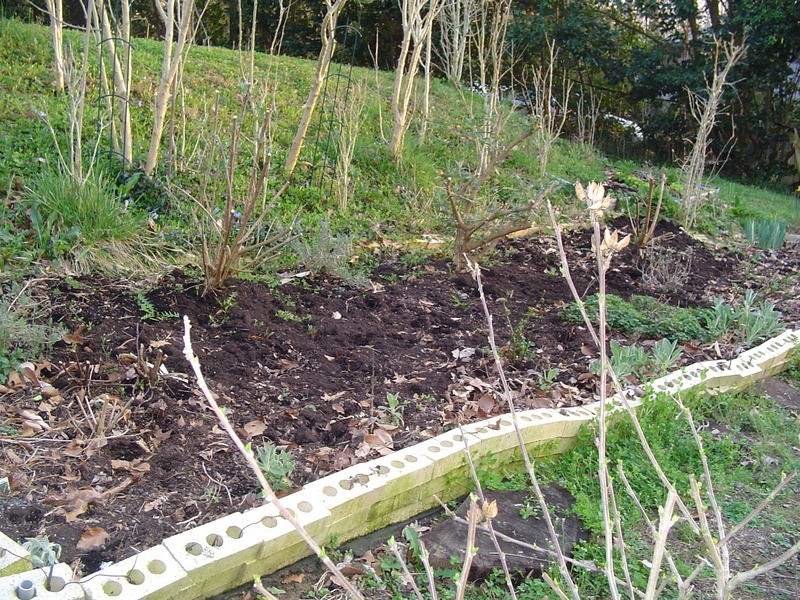 The best plan to protect your garden from mole and vole damage is to grow in raised beds. When you build the bed, put a layer of chicken wire or landscaping fabric on the ground; follow with a shallow layer of gravel, then newspaper, cardboard, or brown paper shopping bags. This suppresses the grown of any grass or weeds up into your new bed. It will break down quickly, and help retain moisture under the roots as it enriches the soil. Build the walls of your bed from wood, rock or masonry as tall as you need them, and fill the bed with topsoil and compost. Laying landscape fabric or chicken wire under a new raised bed will keep the voles from eating the roots of your plants. 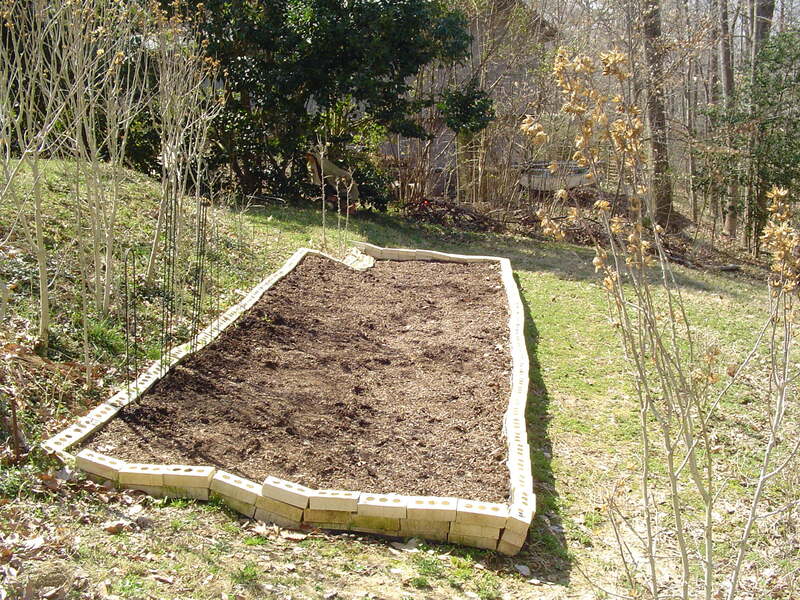 You might also use the Hugelkulture method of building a new bed on top of sticks, branches, leaves, or chipped wood. This woody barrier will also help stop tunneling moles or voles. You may need to slice through the bed’s lining to plant shrubs or other deeply rooted perennials, but your plants will be protected. Many plants will grow more vigorously in a raised bed, especially if your soil is compacted or depleted. It is very easy to plant into the fresh soil. This is also an easy bed to maintain, and will never need tilling. Simply add a few inches of compost each spring, and move plants in and out as the season dictates. Plants grown in raised beds and containers grow much better than plants put directly into the soil around our home. We get larger, lusher plants, with more flowers and fruits; probably because their roots can find plenty of moisture, air and nutrition and aren’t attacked by hungry voles! The steep grade of our yard makes traditional double digging or tilling not only impractical, but dangerous. Building up above the present soil makes more sense, gives a better result, and allows us to put down layers of material to stop the moles and voles from digging up to get the roots of our plants. Our new butterfly garden in May. If you have been frustrated in your efforts to garden or even maintain a lawn by hungry moles and voles, take heart. There are things you can do to reduce or eliminate the damage they cause, without resorting to poisons. Once you understand them, you can find ways to reduce their access to the food they seek, and protect both your landscaping investment and your peace of mind. Daffodil bulbs planted at a depth of 8″, and about 6″ apart all around the root ball to protect it from voles.